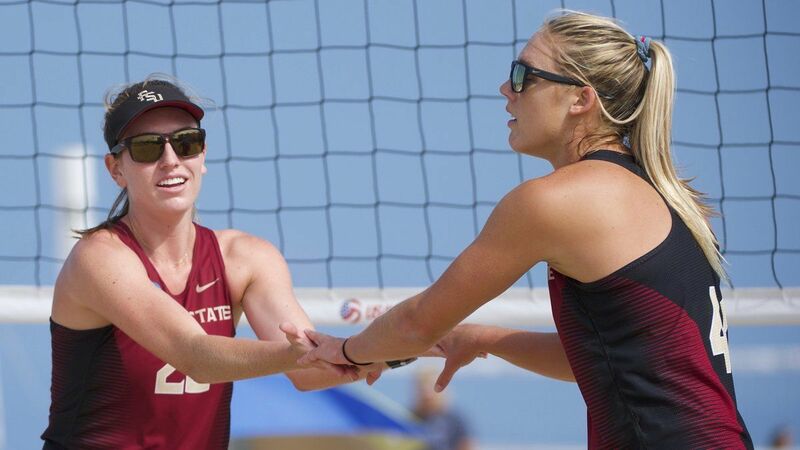 The Florida State beach volleyball team placed a program-high four student-athletes on the Coastal Collegiate Sports Association Preseason All-Conference Team, the league office announced on Thursday (Feb. 22). This marks the second year in a row Florida State placed the most players of any team on the Preseason All-CCSA Team, and the third year a Seminole took the Preseason Player of the Year title in the same number of years in the conference. This is the first season the Seminoles have placed four on the list. Freire makes it back-to-back Preseason Player of the Year honors after another outstanding campaign for the Florida State Seminoles last season. She posted a 29-9 record in 2017, good for second-most wins on the team, and was named to the CCSA Championship Tournament MVP Pair. The Windermere, Fla. native earned one CCSA Pair of the Week honor and one DiG Magazine National Pair of the Week honor in her junior campaign. Her play helped Florida State win the CCSA Championship title and earn the team a second appearance in the NCAA Tournament. The Seminoles also placed senior Tory Paranagua, junior Brooke Kuhlman and sophomore Francesca Goncalves on the Preseason All-Conference Team, while redshirt senior Hailey Luke was named to the CCSA Preseason Watch List. Paranagua recorded her best season with the Seminoles in 2017, leading the team in wins with a 30-8 record. She was named CCSA Pair of the Week once and collected Championship MVP honors alongside Freire. Kuhlman was named an AVCA All-American following an outstanding sophomore campaign, becoming the Seminoles’ eighth All-American honoree and giving the program its 11th honor. She finished 2017 with a 22-14 record, with 17 of those 22 wins coming in the No. 1 position. Goncalves, the 2017 CCSA Freshman of the Year, earned a spot on the Preseason team after tying for the second-highest (with Freire) wins on the team with a 29-7 record. She also garnered a CCSA All-Tournament Team bid, three CCSA Pair of the Week nods and took home the DiG Magazine Freshman of the Year honor.